July 21, 2007, saw the sale of 8.3 million copies of Harry Potter and the Deathly Hallows in the United States in just 24 hours. The book had a cover price of $34.99, but was widely discounted to an average of around $22, for gross sales of roughly $182.6 million. A little more than a week later, the iPhone went on sale in the United States, and in 30 hours (to account for different time zones) Apple and AT&T sold 270,000. Available in two different models, none discounted even a penny, at least 80% of the sales were for the more expensive, $599 model, for gross sales of roughly $156.3 million. At first glance, a novel written for young people and a “smart phone” created for techno-savvy adults have nothing in common. Yet the success of the novel and the phone are due to the same factors: popular culture, an elaborate and reliable worldwide transportation system, and pervasive telecommunications. Significantly, neither Scholastic, publisher of Harry Potter, nor Apple, manufacturer of the iPhone, invested much in publicity. There was no need, since others did such a splendid job of hyping the products. Web sites, newspapers, magazines, and college classes speculated about the forthcoming Harry Potter for years, dissecting all the characters from past novels and predicting what those characters might do in the announced seventh and final book in the series. Major book chains and retailers invested in extensive advertising, set up on-line waiting lists, and went out of their way to convince potential customers that their store (or Web site) was the place to get the novel when it was released. Scholastic, in contrast, was very quiet, saying not much of anything. 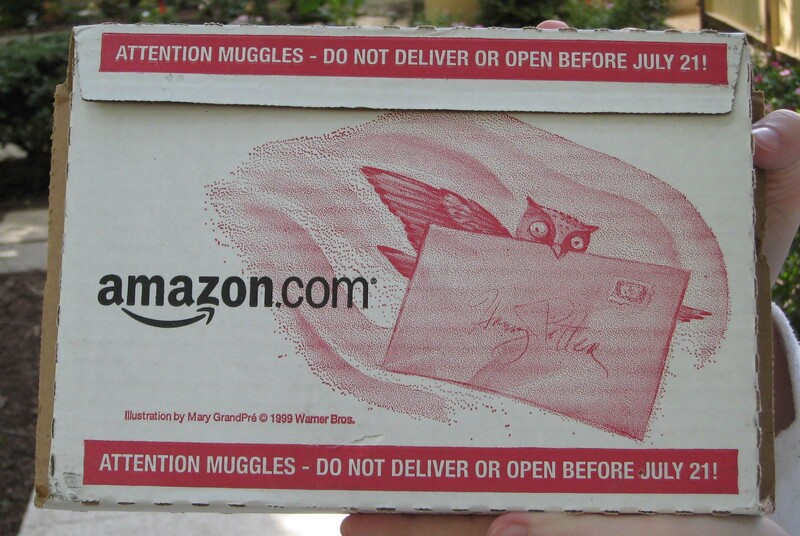 Harry Potter was embargoed from sale until July 21, which presented a problem for the resellers: how do you get millions of copies of a book into the hands of customers more or less simultaneously? The accompanying photos show Amazon’s solution: it invested in custom-made shipping boxes, designed not just to transport the book, but also to hype the book, and Amazon’s logistical prowess, at the same time. Similarly, the iPhone, “pre-announced” at Macworld San Francisco in January 2007, was subjected to intense, detailed technical, financial, and outright fantastical speculation for six months before it went on sale. It was difficult to find a newspaper, magazine or Web site that dealt with technology and failed to mention the iPhone. Aside from a press release in February concerning a trademark agreement on the iPhone name, Apple said nothing about the iPhone for months, not even bothering with another press release until June 11. Both Scholastic and Apple managed to “hype” their offerings through avoiding hype. With sales of over 300 million Potter books to her credit, J.K. Rowling is a one-woman publishing empire. Alleged “leaks” of the Harry Potter conclusion and illegal Web postings of scanned copies of the book just added to the frenzy and kept the book series in the public eye. Apple’s robust computer offerings and sales of over 100 million iPods made the iPhone ripe for frenzied speculation. Stories of long lines of iPhone phone buyers, of problems with getting the phones registered with AT&T, and of phone bills delivered in a box kept the iPhone in the news, adding to its own mass hysteria. The rare and often pathetic “bad” stories, combined with the flood of “good” stories of happy Harry Potter readers and happy iPhone users -- without any of the usual corporate-generated new product marketing – made these two phenomena that much more phenomenal. So let us return to those three key elements: popular culture, a reliable worldwide transportation system, and pervasive telecommunications. The Bible, arguably the most widely read book in history, had its first printing in 1455; an estimated 180 copies were made. It took several hundred years for repeated printings, in dozens of different versions, to reach the level of 8.3 million copies in print, and it is doubtful that even the Bible ever had millions of people attempt to read it from cover to cover in a single night. Harry Potter, thanks to popular culture, is so pervasive an influence that millions of people who have never read any of the books know he is a wizard, have heard of Hogwarts, and know what it means to be a Muggle. The iPod exerts a similarly pervasive influence in modern culture. This one-time latecomer to the portable music world has managed to vanquish portable cassette players and portable disc players, and all other MP3 players are now just footnotes. The famous white earbuds have become ubiquitous, and the iPod’s symbiotic companion, iTunes, is now one of the most widely used Windows applications on the planet. Even non-Apple MP3 players are frequently called “iPods,” at least until someone – almost anyone – throws in a quick correction. A reliable, worldwide transportation system is another part of this success. You could order Harry Potter online and be assured of having it delivered to your door on the date of release. You can order an iPhone online and have it delivered to your door, tracking it every step of the way from the factory in China, within a few days. Pervasive telecommunications is the third element of this phenomenon. You can buy a book, or an iPhone, or a song to put on your iPhone, from almost any Internet-connected computer, and there are hundreds of millions of Internet-connected computers. In fact, once you have an iPhone, you don’t even need a computer; the iPhone can connect wirelessly to either the AT&T wireless system or a local WiFi hot spot, and then you can use the iPhone to order a copy of Harry Potter, or a song for the iPhone, or another iPhone. Of these two commercial successes, the iPhone may ultimately be the more important. 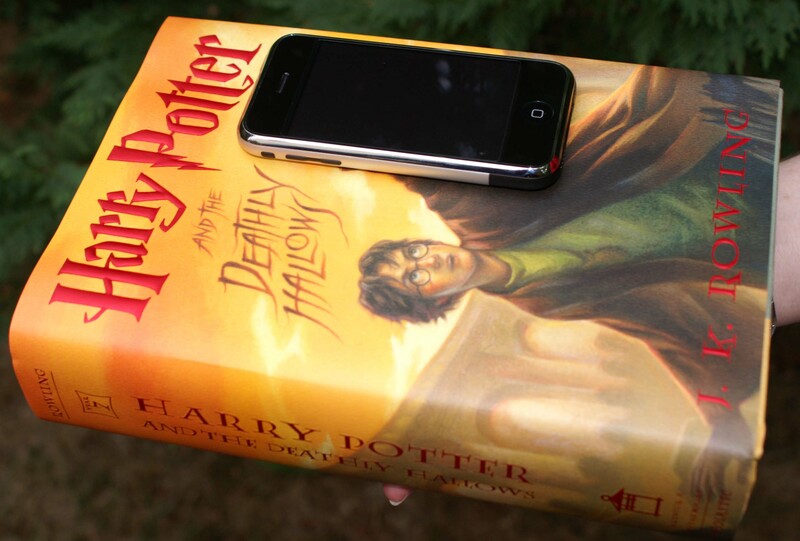 Harry Potter and the Deathly Hallows has about ten million bytes of text. On an 8 GB iPhone, about 6.5 GB is free for storing “stuff,” and if the “stuff” is text, that means a single iPhone could store 650 copies of the book. In fact, 270,000 iPhones could store 175 million copies of a book this size, and in considerably less space than the hardcover originals. With not much effort, the iPhone could become the world’s first practical electronic book reader and portable reading library. This is in addition, of course, to being a telephone, a wireless computer, a camera, a music player, and a cool way to watch a movie on an airplane.